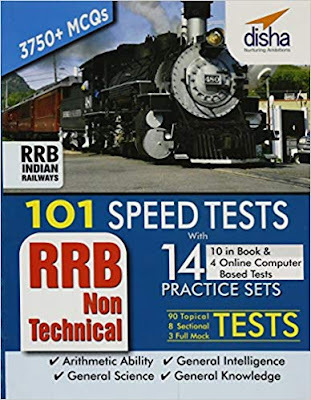 Download 101 Speed Test for RRB NTPC (Non Technical) Exam 2019 Book PDF Free. Disha Publication 101 Speed Tests (Topic-wise) with 14 Practice Sets (10 in book & 4 Online CBT) for RRB Non Technical Exam PDF Free Download. Free Download 101 Speed Test for Railway ALP, Railway Group D Exam. The Ultimate Practice Book is preparatory material for aspirants wanting to join the Indian Railways in the Non-technical category for which the Regional Railway Recruitment (RRB) does annually conduct a competitive examination. This book consist of ten sets of test papers, besides also offers four additional sets that one would have to attempt live on Online CBT. The practice book is comprehensive and covers all important concepts, which would be essentially required for cracking this examination. A well known publisher of good quality educational material, Disha Publishers has been offering students comprehensive and well-designed reference materials for many years. In the past six years the publishing house has brought out more than 120 books. The preparatory books for school curriculum or the competitive entrance examination books and other reference materials are much sought after. Step -2. Search @railwayexamadda and Join the Group. Step -4. Interact and Clear your Doubts Regarding RRB NTPC 2019. Disclaimer :- Some of the Study Materials Shared on this Page are Neither Created nor Edited by bank4success Team. We have taken these books from Internet. We are using this for Education Purpose Only. We also Being the Content Provider and Creator Understand the Hard Work of Author and Publication,and having Immense respect for all the Author. We will be happy to bring Down the Links if you Feel it is Interrupting your Business and Causing Monetary Loss. Please Contact us (Details available in Contact Us Page).